It’s most apparent on a snow and ice covered sidewalk…the way the adult stride ultimately shortens, the increased hesitancy, the palpable fear. And with each ensuing decade the step is progressively shorter, from the carefree leaps and twirls of childhood into the agonizingly slow progress forward in the very elderly. But this happens inside all of us as well. For me, it was in my early forties when I realized my world had stopped getting larger with each passing year, and in fact was getting smaller. It was then I knew I had become, somehow, increasingly risk aversive. I knew I needed to change … or to be prepared, resigned really, for an ever-smaller space for my imagination, my vitality and my heart. I’ve talked about risk in this space before, it is an important consideration in my life and comes up again and again, but I’ve never shared, outside of personal conversation, the image I have developed for myself around risk and growth. It is an image that has proven very helpful to me (it is the genesis in fact for the very name of this blog ) and I feel moved to share it today, here, with you. Perhaps someone else can use this particular image today? I’ve never imagined life as linear, progressing forward in a neat series of chapters. I picture it instead as a wagon wheel. At the center of the wheel, the hub…our essential selves, the spokes … the risk filled journeys we take out into the world, just by living a life, and the wagon rim… the parameters we and others set upon our lives. But here is the thing…the wagon’s rim will in the end define all of the rest. It begins in our lives as enormous and then, in the usual course of things, becomes ever smaller in circumference, the journeys therefore smaller and increasingly insignificant. In my mind, this rim is an elastic band …flexible as we begin in life and having the potential to remain so. This potential can be achieved though only if we, with intention and purpose, push up against the rim’s limits. Barring this, it will inevitably grow brittle and rigid, the circumference growing ever smaller. An ultimately, our inner steps will become as cautious and uncertain as an octogenarian’s external steps on icy pavement. I took a new risk recently, agreeing to direct a piece in a short play festival. I had never directed. I had no idea if I could do it. I didn’t want to let my actors down, I didn’t want to let the theater company down, I didn’t want to let the audiences down…I didn’t want to let myself down. It was scary. But as successful risk always is, it proved exhilarating. I can sense my inner stride has taken on extra length. Honestly, I can actually feel it. And I remind myself once again, of the urgency of coming up against the parameters and pushing with all I’ve got. I know the fullness of my life depends on it. I am a cook and I also have great admiration for a perfect tool (whether in or out of the kitchen, but particularly in.) I have the utmost respect for the focus and artistry of someone who can create an object that is simultaneously utilitarian and beautiful. In an increasingly homogenized world, I so appreciate the unique. Lastly, I love an adventure. All of this being a very long way of saying I wanted to buy a knife while in Japan earlier this year. The stay began in Tokyo and ended in Kyoto with a remarkable overnight in Hakone National Park. I am doing the country a great disservice by not describing each experience we had in Japan in-depth. It was a lifelong dream to go and I could have stayed forever…. But this is a story (sort of) about a knife. My quest for the perfect knife,in this country known worldwide for their incredible knives, began in Tokyo. My husband would go out for his morning run and I, armed with sketched (and sketchy) suggestions for routes from the hotel, would set out on my mission. I’d get lost every time…because, that is what I do. And, in fairness, the fact that there are simply no street numbers on Tokyo addresses might have upped the formidable factor even for less directionally challenged people than I. Some of the shops I never found (but I did always manage to find my way ultimately back to the hotel, so =winning!) and one or two shops seemed not terribly legit. My determination to find this knife (that I knew would give me joy on a daily basis once home) didn’t at all take away from the array of wonders we experienced daily but it was always there…in the back of my mind… regardless of the amazing food, experiences, history learned and sights seen… I was sure the trip would have a small, to be sure, but unmistakable rent in it if I were to be unsuccessful in this task. I was getting a little discouraged that it might not happen as our travels were coming to a close. Then victory!!! Our second to last day in the country, as we were sampling the exotic (to our Western palate) food of the Nishiki Market (fried eel bones taste much better than you might guess…but, you know, fried anything I suppose…) There it was…the mother ship…. Aritsugu Knives ,home of arguably some of the finest knives in Japan. The shop was tiny and absolutely crammed full of people. Normally my aversion to crowds would have kept me far away from there…but…knife, right?! And knives there were. All over the walls, in glass cases that ran down the length of the store, in wooden boxes being slid over the top of said cases, in people’s hands…. and each one was different! How on earth was I going to choose? I finally flagged down a sales clerk and with the help of a friendly translator was able to convey what I needed, the tasks it would perform, how often it would be used. It would at minimum, need a double edge (single-edged knives are most useful for “breaking down” whole birds or game into parts for cooking and serving size portions.) I also hoped it would be beautiful and that it would feel “right”. I held several candidates in my hand , feeling for balance and weight and made my selection. It was beautiful, simply perfect. I don’t think I have the words to convey how happy I felt. I didn’t think I could possibly be happier. Then my translator told me I could have the knife engraved with my name in Japanese or English, my choice. This brought me straight up to an 11 on the happiness gauge, what could be cooler than that? I said, of course, yes and received a short tutorial on the care of my new knife from a fellow in the back of the store as my knife, along with a couple dozen others, was being engraved. Home and Hallelujah , there it was, still beautifully wrapped, brimming with promise. I prudently waited several days , major jet lag and super sharp knives do not play together well…and then, finally, it was time!! I set out my cutting board and the pile of ingredients to slice and chop, grinning ear to ear as I unwrapped my treasure…. I held it in my hand , I looked down at the beautiful inscription and then I saw…. It was the wrong knife. Somehow in the scrum of customers in that tiny shop, my knife had gotten mixed up with another’s. Instead of two edges, it was single-edged. The exact wrong tool for the work it was to do. And I laughed. I knew in that instant it was never about the knife itself really, it was about the adventure. The alleys I searched for it in, the sights I discovered when I’d get lost, the strangers that helped me, the admiration I felt for the man engraving it , the goal in itself which gave a particular shape to the trip… all of these were really where the sweet spot of my search lay. And I know I will forget, I invariably do, but perhaps I can remember that fact on my next highly focused quest… it will shed a softer, broader light on a razor focus. And I am pretty sure that makes not only for the best kind of searching, but also, and more so, for the best kind of living. One of my favorite quotes of all time isn’t poetic or spiritual or deep or elegant. The late, wonderful , Broadway actress, Marian Seldes said it and it is about as plain and unvarnished as you can get …and for me, one of the most very essential truths about myself. It is this homely little nugget. “Well, I love a task. I really do.” True enough about me that it could be my epitaph. I love everything about tasks: feeling competent, feeling useful, feeling engaged, feeling challenged …and best of all perhaps, satisfying my closet OCD nature by being able to check something off a “to-do” list. I feel absurdly happy just writing this paragraph…. THAT is how much I love tasks. I also have a tendency to completely lose myself into a large task at the expense of all else including the most basic of things, sleeping 8 hours, eating properly, exercising every day… I get a little, um, intense about my large projects. Oh fine, the truth is, I get really, really intense. And this is a good thing…for the project. I get some very high quality work out there as a result. And it is, generally, good for me too. Right now though, I am trying hard not to take on any new thing, no auditions, no classes, no volunteer work. I’ve come out of an intense three-year period working with all I have on two huge tasks, one of which was voluntary, the other essential. One was the grueling hard work of earning Professional Chef Certification, the other helping my daughter with special needs begin a new stage in life. I gave each absolutely everything I had to give, and sometimes it felt like more than I had to give. Two such different things… both pursued with passion. Both completed so satisfactorily I could only collapse at the end into the most profound gratitude. And collapse is le mot juste. I am played. I am very happy, I am very grateful and I am very tired. It is time for sabbatical. Time to make my well of energy and creativity fertile again. Time to turn over the earth of my imagination, harrow those newly turned fields, lifting out all the weeds and clods…. and let all lie fallow a bit, and perhaps to see what unexpected seeds may be lifted by gentle breezes into the newly nourished lands of my being. I know it won’t last too very long, something or other will show up seducing me to jump in with both feet…but for now I am going to try to hold onto doing nothing but enjoying my gratitude… and settling in for a time of taskless thanks. One of my favorite things to do all by myself is to walk in the woods . With no companions to distract me with agreeable conversation, my eyes take in the clouds, the stones and this time of year, the mostly bare dark tree limbs, scouring the sky. The aromas all around me become prominent : the sweet smell of the gently decomposing leaves, the wet smell of the earth and moss ….and my ears are alert to the subtle sounds of wind, my feet on the path, the occasional dogs and people encountered and lilting birdcalls…. But just as alert to the absence of the ambient sounds that thread through the day: the fan of my computer, the ringing phone, passing cars, the thrum of the steam boiler making this drafty old house, in which I am typing, warm…all of it gone…the lack of it making the world seem new. But there is another component to these adventures as well …getting lost and finding my way. For me, getting lost isn’t a casual thing; getting lost terrifies me. And terror is not too strong a word, my heart pounds, my breath becomes shallow, my adrenaline surges and all my senses become highly attuned. It is that heightened focus that makes the heart pounding worth it for me I suppose. It is not dissimilar to what one feels on stage in a live performance. In a world where our focus is pulled in so many directions at once, to have such intense focus is a gift. On the other hand that level of fear is not optimal, to say the least. So I try to keep track of my meanderings, left at that huge lichen encrusted limb, right at the remnants of a colonial farmer’s stone fence … But, I’m not really very good at it. My mind wanders, one lichen-covered branch can look much like another…and besides I have no natural sense of direction. So I get lost rather a lot. Pretty much every time. And then there is getting lost going forward. You are on a trail, maybe a not particularly well trodden one and all of a sudden it isn’t at all clear where it leads. You stop in your tracks, you scratch your head and you scan the leaves, stones and grasses ahead. No clue. I’ve found over the years, a surefire navigation guide at these junctures, I look back. Somehow once you look at the path you have already walked it makes it clear how the path ahead lies. Every time. Helping my daughter navigate a new, clear and fulfilling path has so filled my days and nights… and my dreams…that I never concluded this writing started a few months ago. The leaves are now covered in snow, the aromas more subtle, the birds are down to the hardy few species that survive New England winters. But I thought of it today as she is almost there. And to see the next steps with clarity it is time to make myself, so fiercely focused on the path going forward this past many months, even years, go back for a bit. I’ll linger there just long enough to garner what wisdom I can, warm myself with memories and gain energy to shine on my daughter’s continuing path forward. It is a most remarkable one, her path, in both directions . I look forward with a loving heart to witnessing all she discovers about life and herself on her way, she won’t get lost. There was a flood of images and sensations that immediately came to me with those three words. I remember my Mom’s hands like I held them yesterday: long tapered fingers, immaculate nails, knuckles enlarged with arthritis and constant use ,skin smooth from assiduously applied lotions and creams …and above all, even on summer’s hottest days, hands that were, almost impossibly, cool to the touch. She passed away ten years ago… but if I close my eyes I can imagine those cool, cool hands gently cupped about my face and if I continue keep my eyes closed too long, the sensation is strong and real enough to bring tears to them. In later years, she turned to fancy needlework, She did all manner of beautifully wrought work, ultimately falling in love with embroidering on thin cloth with fine denier silk thread. My Dad, an artist , would draw an outline of an image on the smooth silk cloth for her and she would slowly and meticulously bring it to life in a riot of vibrant color. In her last years she became legally blind but even as her eyesight was failing, with the help of magnifiers and special lights, her hands would carefully move the thread over and under the stretched cloth canvas of her work. When the time came that it fell to me to pack up, donate and discard my Mom’s possessions upon her death, it was, as these things are , emotional and exhausting but surprisingly to me, healing too, almost Zen. As I was coming to the end of it, opening her bottom-most dresser drawer, I came across the very last canvas she had been working on, plastic rods still there as stretchers, silk still threaded onto the needle, as if one day she might be able to see, as if one day she might complete it. And in fact, complete it would have been if she hadn’t ripped out to re-do the stitches on the green heron’s legs and feet dozens, maybe hundreds of time because, increasingly, they didn’t look sufficiently perfect to her. So when she died it was unfinished and I discovered it carefully wrapped in tissue, lying in a drawer. 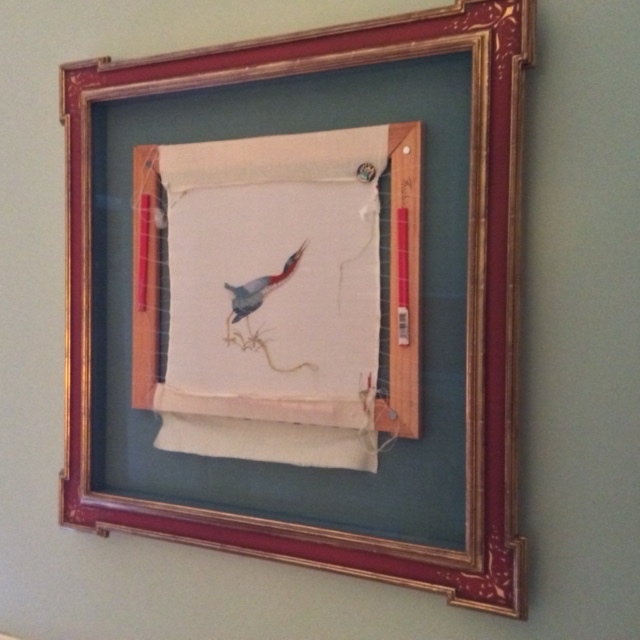 Deciding it was too beautiful to languish hidden away, I had it framed: tools, needle, unfinished canvas and all. It is one of my most treasured possessions and when I show it to people who have come over for the first time I am not only proud of my Mom’s work, I tell guests too about the lessons it teaches me about how things don’t have to be finished to be beautiful and how the quest for perfection can stand in the way of doing what we hope to do. Mostly though, I just like to look at it. As a friend reminded me today, every daughter’s story begins with her Mother’s story. My Mom embroidered her story into my heart. Sometimes that story feels like the stab of a sharp, fine needle but more often than not , it evokes the incredibly soft feeling of a skein of silk. 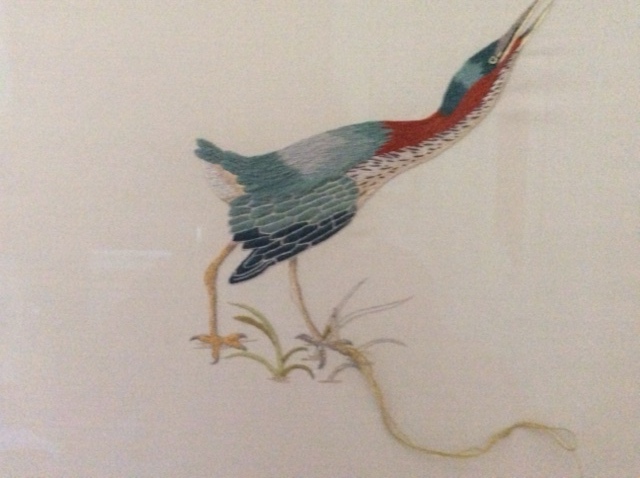 Her story, like the green heron, was never finished in my heart … as mine won’t be in my daughter’s. And so it goes. Which I think might be just as it ought to be. Sitting on the pretty backyard deck, eating the last of the classic barbequed dinner, my daughter’s new friend L. mentioned she’d like to show off her room. Noting my daughter’s walker, L. asked if she could manage going up stairs. “No, I can’t.” M replied and then, “I used to be able to.” This said simply and plainly, with an undertone of deeply mature sadness, sadness perfectly echoed in my own heart. This year, as her diminished strength became increasingly clear, has been a time of both frantic activity and slowing down to glacial speed. Learning, exploring, and questioning to find the best ways to support her in this journey have been my top priority, and quite rightly, she deserves it. At the same time my creative and active life has come to a dead stop… well, except for cooking…I find so much peace in that, I will always do that I think. But barring that, I have ventured absolutely nothing that I hadn’t previously committed to… I haven’t auditioned, I haven’t written, I haven’t planned any new adventures… some days it has been a challenge to leave the house. Sometimes the plans I had already committed to seemed too formidable to imagine. A certain amount of this is inevitable. I want to fully pour myself into supporting my daughter in making her life full and joyful… I mean, of course… who wouldn’t? I wonder though if something else is at play here. I wonder if I am unconsciously limiting my life in solidarity with her. I think I may be. I’m generally a believer that the truest gift of sorrow is the increased capacity for joy…what I’ve never thought about is raising the ceiling on my tolerance for joy, perhaps because it is usually relatively high …I’ve always thought more about digging deep than reaching high, but maybe I need to do both. And maybe an important gift I give my daughter is climbing the stairs when she can’t. In anticipation of New Year’s revelers, the towering public service signs alongside the highway screamed out their message …in an utterly silent, yellow lights on black background way. I am going to try, I thought. I am going to really try. A dinner conversation a few nights previous touched briefly on a hypnotist entertaining a high school graduation audience the prior June. One of my sisters in law was seated next to me and she said she had done some online research about hypnotism and she concluded from her investigation that consensus holds we are all hypnotized, all of the time. We are all hypnotized, all of the time. I have been haunted by this notion from the moment I heard it. Haunted because I know that whether it is true or not for everyone, it is most certainly true for me. I began to realize how many exit doors I set up for myself from the here and now every single day, they are manifold. Among them, the time I spend with my array of electronics stands out. I begin my day early, in the dark, the only light coming from my ipad or phone. My waking takes place in this blue light. I read my email, the news and , until very recently , social media updates , those of my friends and comments on mine. And once begun, I am intermittingly in that blue glow all day long and into the night , until I deposit my glowing device bedside…ready to be my morning light. I am no Luddite, I adore all of this stuff. I am typing this now on my laptop and in a few minutes I will be publishing it electronically. I love the many things available to us online , from knowledge to music to books and to widgets. But once aware of how I have allowed my life to be inch by inch taken over by that lovely blue screen… I can’t look back. I will still use all these things but more sparingly, knowing the cost. I’ll even eventually return to social media as it is communication nirvana for a highly social introvert such as myself but for now… a little time away. I want to come out from behind it. In this year and the years ahead, I plan to arrive alive.